Business Optimizer is a two-fold, comprehensive software and methodology solution to properly assess your organization against World Class standards while simultaneously building the improvement plan needed to drive business excellence. With built-in industry specific assessments, Business Optimizer identifies opportunities throughout your organization’s business foundation, people, processes, and production facilities and provides improvement actions. Each opportunity and action is mapped to risks, consequences, and benefits to produce a business roadmap best suited to your business objectives. What areas are considered strengths of the organization? Where are the gaps between current state to best in class? What are the actions, activities, and changes required to achieve best in class? What training or skills gaps have been identified? How can the organization reduce operating costs in order to increase EBITA or margins? How can the organization increase the utilization of its worksforce and optimize assets (increase OEE)? Identify opportunities across your organization with over 30 areas of performance evaluation encompassing your business foundation, people, processes, and production. 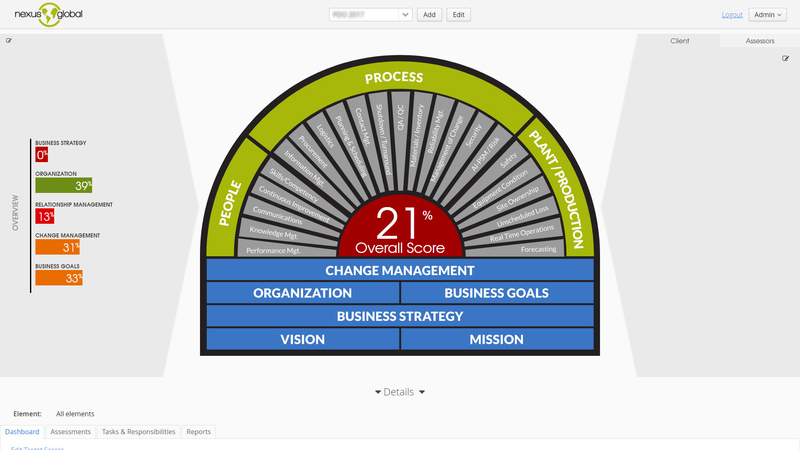 The starting point for organizations to customize their business evaluation. Access best practice assessment questions used across your industry to drive World Class performance. See how those questions are mapped to globally-recognized, published standards. Measure your site against others in your organization or across the industry. Your report is your data collection tool, providing intuitive controls and instant readouts on progression and completion. Drill through measures, criteria, questions, and actions with minimal clicks. 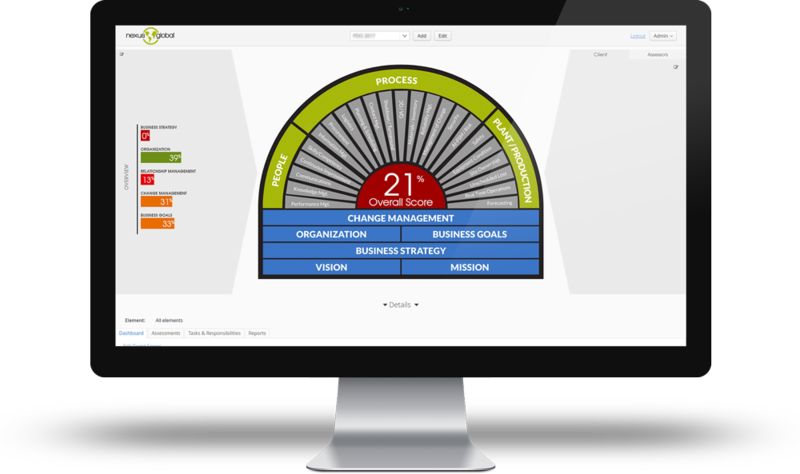 This interface provides transparency and alignment throughout the organization. No more questions or uncertainties about criteria or evaluations, you possess the knowledge. Assessment criteria and elements identify improvement actions as well as risks and potential consequences associated with each. These are categorized so organizations can finalize their implementation plan; effectively designing their project with quick wins, short term goals, long term impact, and sustainability actions. These align assessment tasks and accountability to tangible business objectives, individual goals, and corporate goals. This knowledge and methodology enable organizations to be their own consultants, continually returning to the tool and data to re-evaluate and improve.